Congressional salaries: Senators, representatives, and their staff all deserve a raise if we are going to attract the best talent. 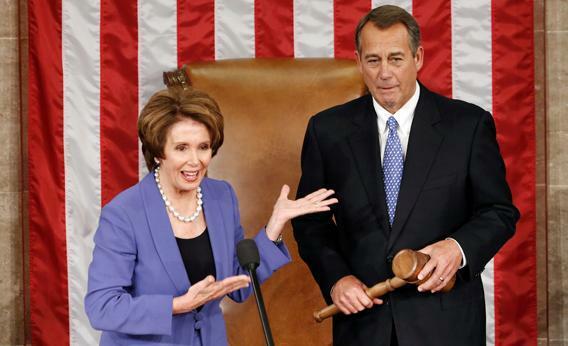 Nancy Pelosi and John Boehner could really use a raise. Really. Americans loathe Congress. Cockroaches, traffic jams, and colonoscopies have higher favorability ratings. Important decisions are endlessly delayed because of petty bickering and political posturing. Congress’s biggest accomplishments these days are government shutdowns and a costly budget sequestration—precisely when the U.S. economy is struggling to rebound. That’s why Congress needs a big fat pay raise. You read that last line correctly. Members of Congress are overworked and underpaid, and we are all suffering as a result. While plenty of people are willing to run for Congress, being in office isn’t what it used to be. Senators and representatives earn less than they have in decades. They don’t have the same level of staff support, even while the workload has exploded. They work in a poisonous political environment. Representatives have every reason to keep an eye on the exit—they all could earn more as lobbyists. We get what we pay for, and there’s no question we are not paying enough to keep the best people on the job. The average member of Congress earns $174,000 a year, a lot more than the median American household of $50,000. But it’s not as much as the median starting pay of $234,000 for a dermatologist, and doesn’t come close to the $9.6 million that the CEO of a typical public company earned in 2011. For an apples-to-apples comparison, we have to look at what members of Congress earned in the past, and how much they could earn at other jobs. If representatives were paid today what they brought home in 1992, adjusted for inflation, they could expect a $43,000 pay bump, bringing their earnings to $214,000. Nowadays, a member of Congress who “retires” and becomes a lobbyist—a fairly common career move—can expect his or her pay to jump to at least $700,000 (for a representative) or $1 million (for a senator). As former Sen. Jim DeMint recently said, “Leaving the Senate to become president of the Heritage Foundation is a big promotion.” His salary sextupled to more than $1 million. That’s a heck of a promotion. For the superwealthy—and some members of Congress are superwealthy—salary doesn’t matter. According to my analysis of Center for Responsive Politics data, 18 percent of representatives and senators in 2011 had an estimated net worth of $5 million or more. They probably wouldn’t even notice if they got a raise. For the 30 percent with a net worth between $1 and $5 million—the “wealthy”—a better paying job isn’t something they’re likely to sneer at. As for the remaining 52 percent, landing a K Street gig as a lobbyist is pay dirt. It’s probably their best chance to join the top 2 percent of U.S. income earners, pay off campaign debt andthe kids’ college tuition, and put money aside for retirement. During campaign season, you often hear candidates say we should be “running government like a business.” Not at these wages. A recent study by the left-leaning Economic Policy Institute found that the CEOs of America’s 350 biggest companies were paid 231 times the salary of a typical worker. By comparison, members of Congress earn 6 times the average pay of the lowest paid employee in their offices. Looking across the globe in Singapore, where running government like a business is actual policy, the prime minister earned a whopping $1.7 million—or four times President Obama’s $400,000 salary. Meanwhile, government ministers take in $1.1 million, or 5.5 times the $199,700 earned by the secretary of defense. (These are Singapore government salaries after some big across-the-board cuts.) Singapore, long considered one of the world’s most efficient governments, adopted seven-figure salaries for top public service posts to attract talent and prevent corruption. It worked. When we look at the incentives for congressional staff, the situation is even worse. Few voters realize that for decades we’ve been downsizing the staffers that support senators and representatives. The people who do realize it are the lobbyists and think tanks that have been cherry-picking seasoned staff in a successful bid to extend their reach into congressional offices. Comparing the late 1970s with the mid-2000s, the total number of committee staff in the House has shrunk to 62 percent of its previous levels, while the staff in the Senate is at 67 percent of its former size. The number of personal office staff in policymaking roles in the House is at 69 percent of previous levels, and in the Senate at 86 percent. Legislative support agencies like the Congressional Research Service and the General Accountability Office took huge hits. Sen. Tom Coburn, a fierce opponent of government spending, recently decried cuts to GAO’s funding in a report titled Shooting the Messenger. Adjusting for inflation, pay for congressional staff has been flat for the last 25 years. Only the chief of staff and the legislative director—the top two policy slots in a congressional office—earn more than their 1980s counterparts. As surveys by the Congressional Management Foundation have revealed, many congressional staff are inexperienced newcomers. All too frequently, they don’t have the expertise or experience to understand the nuances of the agencies they’re overseeing, especially when compared with better-paid executive branch bureaucrats who’ve been around for decades. These young staffers are also up against the older, wiser versions of themselves who now work for special interests. There are just about as many registered lobbyists as congressional political staff on the Hill—about 13,000. With the huge reduction in congressional staff, lobbyists and think tanks often set the congressional agenda and are a major source of expertise about how government works. Congressional staff depart through the revolving door with alarming speed, as a recent Washington Times story shows. Like senators and representatives, staffers are paid well to leave, and as a London School of Economics study found, they receive an additional pay bump so long as their former boss remains in office. This is dangerous for our democracy. And not surprisingly, many very competent people no longer want the job. The last two elections brought the largest class of freshman representatives in 60 years. During the same time, the House’s budget has been cut by more than 10 percent, and funding for committees in 2013 will be slashed by an additional 11 percent. If we want our representatives to work for us, we must pay them well enough to stay focused on the people’s business. We should make sure they have enough competent, experienced assistants to do their own research and draw their own conclusions. Right now we aren’t paying for quality work, and it shows.